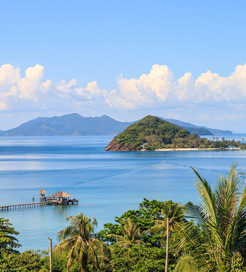 Just 40km south of the mainland lies one of Thailand’s best kept secrets, Koh Mak. A tiny island measuring just 16sq km, Koh Mak offers a peaceful retreat from the hustle and bustle of Thailand’s tourist hubs and full moon parties. It is the largest privately owned island in Thailand and there is a distinctly quiet, relaxing vibe. Most notably there’s virtually no crime and a much quieter nightlife, making it the perfect family holiday destination. Once you arrive on its sandy shores you’ll be greeted by around 600 smiling locals, 10,000 palm trees, secluded white beaches and a fascinating rubber plantation. There are around 30 resorts on the island and the two main beaches are within walking distance of each other. ‘The Sunday Times’ recently featured Koh Mak as one of the top ten beaches in the world. Ao Kao beach in the south west is the most popular. The low hanging coconut trees and stunning sunsets combine to make an ideal romantic setting. As the island is part of a marine national park, it offers fantastic snorkelling and dive sites. A range of water sports is also available, including kayaking and windsurfing. The hilly landscape is perfect for mountain biking and hiking as well. Whilst on your walk, be sure to stop off at the impressive Buddhist temple lying in the heart of the island. Sampling the locally caught seafood in a beachfront restaurant is a great way to end a long, relaxing day. Koh Mak is accessible by ferry from Laem Sok on the mainland and Koh Kut on the island directly to the south. With an average sail time of 20-30 minutes from both ports, getting to Koh Mak is quick and easy. Boonsiri High Speed Ferries operate 2 sailings a day from Thailand and 1 from Koh Kut, with large, comfortable ferries. They also offer bus transfers to Laem Sok from Bangkok and a few hotels in Pattaya, ensuring an even easier journey. For more information, please visit our Ferries from Koh Kood to Koh Mak page. For more information, please visit our Ferries from Thailand to Koh Mak page.